Can I suggest some reading about olives? I’m offering a smorgasbord. Here is a link to an online piece called “Graft and Corruption: On Olives and Olive Growing in the Pre-Modern Mediterranean” about the history and practices of olive growing. From the website of the Maxwell Institute of Brigham Young University, this is the introduction to a larger work, but covers lots of interesting history of olive cultivation. A search on Amazon for “olives” turns up thousands of books (including those by authors named Olive, of course), with a lot of interesting titles. Many, like Olive Oil: Cooking, Exploring, Enjoying, deal with using olives and olive oil in cooking. Others, like the Olive Production Manual, are practical guides to growing olives. One particularly caught my eye, because I enjoy reading memoirs. Olives, by Mort Rosenblum, has positive reviews and looks like fun to me. Have you read it? If so, throw in your two cents in the comments! This entry was posted in Books, Food and tagged history, Italy, olives. Bookmark the permalink. That’s a familiar scene over here too. 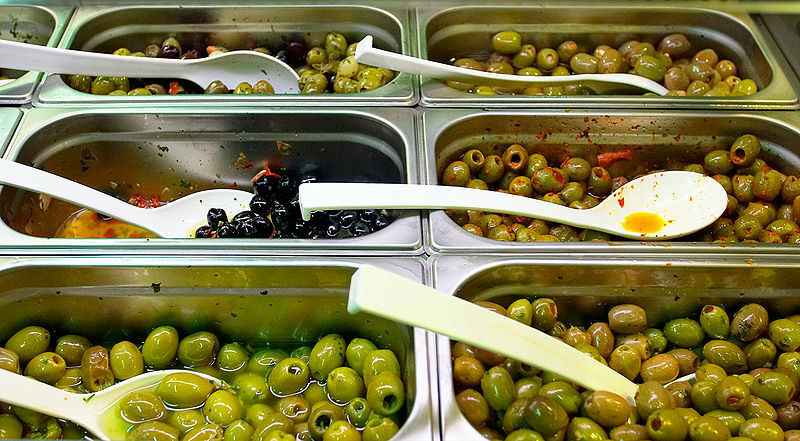 I think olives in Spain are eaten more raw, I mean less herbs and all. They are really versatile aren’t they? I haven’t read any of those books mentioned above but I just wanted to leave a little comment after seeing the olives photo. Have a lovely Friday!